I made this carrot soup, for the first time while shooting for the Lady Carrot and Carrot salad posts and we had way too much carrots in da house. But I actually quite like it, so now its one of my fav EasyPeasy recipes. 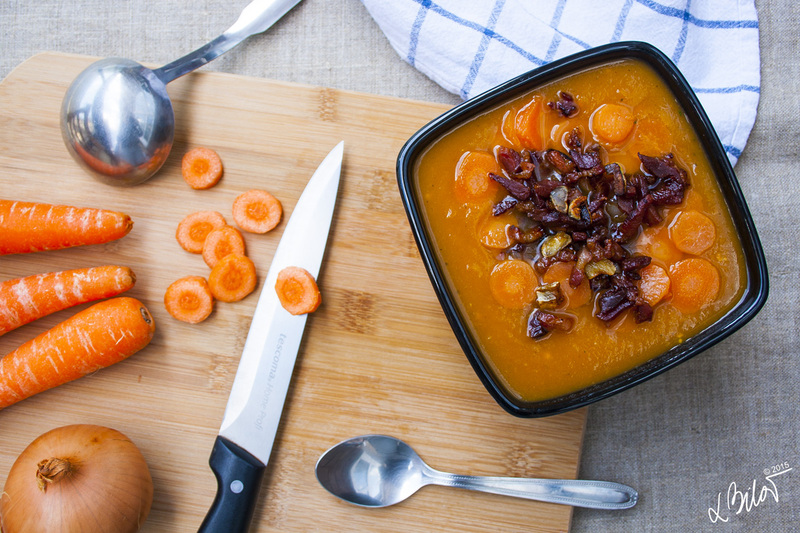 Healthy & light lunch made from 2 simple ingredients – carrot & onion. (I use OXO, no salt needed with these) A healthy alternative would be a fresh broth. OR: Use herbs & spices or a vegetable broth for vegetarian version. Use vegetable broth or soup for more flavour. You can always make it a bit more interesting by adding some fried onion on top. EasyPeasy, you are ready to serve nice & hot. Add 2 Chicken bouillon cubes into soup together with onion and carrots. Taste before you add salt, some bouillons are a bit too salty. While the soup is cooking, no need to hypnotize it. Be useful! Cut some ham into a nice squares, wash and cut 3 crispy spring onion shoots. Now you can add some taste and calories to that light & creamy soup of yours. YumYum! If you are fanatic about everything being fresh & home-made use a broth instead of cubes. You will have to spend a bit more time & money on cooking or you can buy some pre-made broth and use it as a base of your soup instead of water. Don’t go lie down, don’t call your mum or run out for a quick fag, while its cooking! You really don’t want to clean that over boiled carrot’s mess :) Be useful! Cut some bacon & garlic. Fry them on medium heat until the bacon is nice and crispy (no need for oil). Now you can add even more taste and calories to the carrot soup. Enjoy! Best served warm as a starter or light dinner. More flavour can be added with some fried onion, bacon & garlic or fresh spring onion & ham. For spice lovers simply add one chilli pepper during cooking. Blender – I own Russell Hobbs 18980 Desire 3-in-1 Hand Blender got it from Amazon. Price, size & performance: 5 stars – can only recommend. Previous PostSheep in wolf’s clothing?